Navigate to Sales > Add a new package. Type in a name for your package, and a description. The URL will auto-populate, and can be used if you want to add a link from your website directly to the package, as explained here. • Public package: This will be available on the sign up page for anybody to view. • Private package: This will only be visible on the sign up page if the special offer code linked to the package is entered (Article 10. Creating special offer codes will explain how to create these and link them to a package). • Referral package: This will only be visible if a member's referral code is entered on the sign up page. Click here for a guide to using referrals. Next, if you have more than one facility on the system, you can decide if this package will apply to multiple facilities by switching the toggle on (to the right) and selecting the extra facilities from the dropdown menu (NB: If you only have one facility on the system, this option will not be visible). If your package has no charge, select this option and then skip to step 7. If your package is chargeable, you will now need to set the payment details. Decide if your package will have ongoing payments, a one-off payment, or a combination of both. • Ongoing: Select your payment method, select the ongoing charge option and enter the charge amount. After this, select if the payments will be taken monthly from sign up, or on a specific day every month (so you can set up all of your payments to be taken on 1st of the month, for example, and the pro-rata payments will be automatically calculated for members who join during the month). Finally, decide if you would like a delay on the payments starting. • One-off payment: Select the main payment provider, and then select if this package includes a one-off payment. After this, enter the payment amount. • Ongoing & one off: Please follow both of the steps above to set up this payment option. Click 'next' to navigate to the Access Details tab. 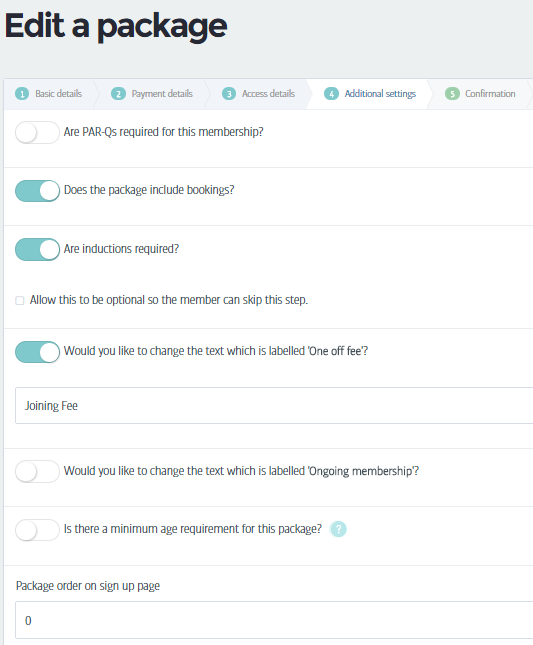 If you have created a package with an ongoing payment (either on its own or with a one-ff payment) then here you will need to enter what the minimum contract length is for the membership. If your package does not have any payment, or has a one-off payment, then here you will be able to enter after what duration the member's access will expire. Select if this package allows access to the gym, and then click next. Here you can see your package summary before deciding if you would like to change this text. The 'package order on Sign Up page' allows you to order your packages and how they appear to members. Please note that '0' will be the first package on the sign up page, and all packages are defaulted to '0', therefore all package order numbers will need to be changed. Once you are happy with the package settings, please click next. Here, you can view the final details of your package before clicking 'finish' to complete. Your package will now be visible in the packages section of the site. For an explanation on how to use the packages section, click here.